Now, time for an announcement, one made with mixed feelings. The release of From the Deep of the Dark early in Feb 2012 will be the last of my novels set in the Jackelian world for a while, as I’m currently working on the first in a major new fantasy(ish) trilogy. More on that later… at this stage, just let me say the new books will be unique and different from anything else out there! The last seven years have been quite a ride. The first of the Jackelian series, The Court of the Air, went to auction and had all the big British publishers fighting each other to publish it. It was the first fantasy debut to go straight on the shelves of Tesco (an odd metric for success to my ears, but those who work in the biz will know how unusual this is). It was voted the best novel to be turned into a movie at the German Berlinale Film Festival – the largest film festival in the world, only being derailed in its jump to the big screen by the fact that ‘The Golden Compass’ tanked and killed every post-Tolkien fantasy movie cash-in then on the production slate. All of this went well beyond the dreams of a new author. Like most of you reading this, I would have just been happy to be published! The sales of the first book caused many of the large publishers to start commissioning steampunk novels after decades of believing the genre was a death trap (the one which nearly claimed China Mieville’s career, I was gravely warned prior to my publication). This large wave of me-toos that came following The Court of the Air in turn helped jump-start the steampunk-as-lifestyle movement. The gold rush didn’t quite work out for most of the steampunk novels, at least financially, I have been led to believe. 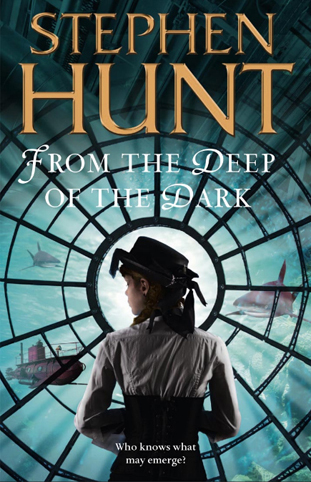 As one author later wrote… ‘There’s not a steampunk market, there’s a Stephen Hunt market’. Ironically, I’ve never truly believed my Jackelian books were steampunk (which is a sub-genre I love, incidentally). Set in a far future with a Victorian level of tech after an ice age, sure, but sorely lacking walk-on parts for Abe Lincoln and John Carter and Queen Victoria and Sherlock. My inspiration for the Jackelian Kingdom was a blend of Michael Moorcock and Mike Butterworth/Don Lawrence’s Trigan Empire, far more than The League of Extraordinary Gentlemen. I just loved the Victorian culture, and thought I’d crib from it for my world just like Mike Butterworth and Don Lawrence stole ancient Greece and Rome for their Trigan books. You can actually read my Jackelian novels in any order (and the later ones are, critics tell me, far better), as I set them all as stand-alone adventures with some shared characters… think Discworld, rather than the Lord of the Rings trilogy, or A Song of Ice and Fire. Get to the end and you may too feel the dampness of the bitterwseet tears that were shed while writing this last book in the series.